It is hard to imagine functional training without a Kettler Kettle Bell. It offers versatile training possibilities, excellent training features, an ergonomic handle (iron handle for perfect swinging qualities ) and a neoprene coated body also protects the floor. Start your highly efficient training with the Kettler Kettle Bell. With kettlebell training you strengthen i.e. your arm muscles with biceps curls or train your shoulder muscles with side/front lifts. 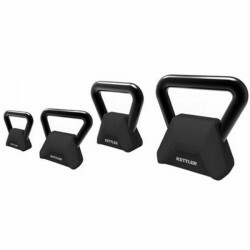 Kettler Kettle Bells can also be used as additional weights for ab training (crunches). kettlebells allow you to do a more dynamic training than average dumbbells. With Kettler Kettle Bells you train several muscles at once rather than just training individual muscles. Kettlebells are becoming more and more popular, since they offer versatile and efficient training at home. But kettlebells are also extremely popular in gyms due to the diverse training possibilities.